As promised from my last post, I have added a dessert recipe on my recipes page for your Thanksgiving menu! 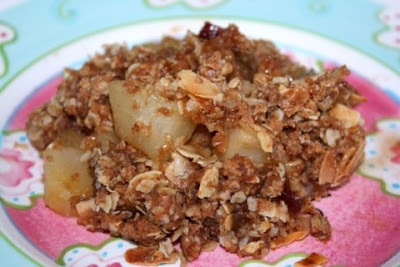 Go get my Gingered Pear Crisp from Vive le Vegan! This dessert is easy to make, and also offers a sweet finish to a meal that isn't heavy or rich. Be sure to serve this crisp warm, with either non-dairy ice cream... or better yet, Celestial Cream! I was thinking of making this recipe for Christmas!!! It looks so delicious. I made this recently but subbed apples for the pear..it was fantastic! A really sophisticated taste, IMO. Great topped with some vanilla soy ice cream! Mmm... I love your pear crisp and have made it many times. I vary the fruit but the pear version with ginger is delish. I love when you pull out your older receipes. I will have to make this one for sure. I just bought your ed&bv for my sister to complete her collection. I have been fortunate to have all three of my books signed by you. Any chance of getting her books signed too? Thanks to Sara Palin's video of the turkeys getting killed behind her and Peta's video of turkeys's being abused we had 6 non turkey eaters at thanksgiving this year! That was something to be thankful for!